Admission is free for children under 12, Museumkaart holders, Foam Fan/Club/Fund members, ICOM members. The last day of Foam Fusion begins with a live concert and ends with the much-anticipated Dead Darlings art auction. Dead darlings anonymous art auction. Paddles up! Start your Sunday morning with a live concert by Pitou, the young and talented singer-songwriter from Amsterdam, supported by two female singers. Her music is characterised by vocal harmonies on the cutting edge of classic, folk and world-music. 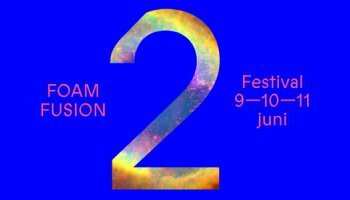 During the Foam Fusion weekend, the refurbished Foam Studios will host an open, collaborative experiment. Starting with a photographic image, over the course of the day the image will be modified and elaborated by different visitors in a variety of media. The result will be a special, joint final product of all visitors at Foam Studios. 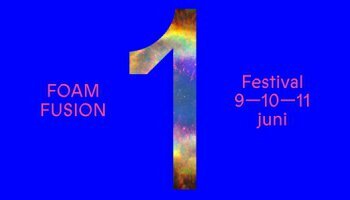 During Foam Fusion on Saturday and Sunday between 11.00 – 17.00 hrs. there are workshops to make Zines in the exhibition Collectivism with 8Ball. With guidance from this New York collective and museum teachers you will work with polaroids, tape, texts and collages to make your personal page. All pages will be bundled and copied into a zine. At the end all participants receive a copy, which is the end result of what you made as a group. Word and image: these are the two main ways we express ourselves. Although the two are sometimes in conflict, a new generation of photographers, writers, publishers and online platforms are creating alternative interactions between text and photography. This panel discussion focuses on unconventional collaborations between photographers and writers. As a photographer or artist, how do you achieve an inspiring and fruitful collaborative relationship and what elements can cause such a collaboration to fail? Some guests will give insight into their artistic practice as it relates to intimate and essential collaborations. They will talk about the do's and don'ts of working together and highlight their value in the creative process. Dead Darlings is an anonymous auction series that, by tradition, introduces all lots by title only. The contributing artists are listed, but the connection between the works and their makers is not revealed until after the sale. The auctioned pieces are works that no longer fit into the artists' output as a whole, but still hold a special place in their hearts, thus the title Dead Darlings. They are the innocent victims of the artistic process, given a chance to be liberated from that context and appreciated for the qualities they display as singular autonomous entities. ATTENTION: The auction is cash-only. There is an ATM machine around the corner from Foam. This presentation for Foam Fusion shows a selection of work from the Foam collection made by artist duos. Working as an artist duo sparks the imagination. How do such collaborations work? Who comes up with the ideas? Who takes the photo? And who presents the work to the world? These are typical of the questions asked of artist duos, but usually these are not very important matters for the artists themselves. For them collaboration is in most cases an organic process in which authorship is collective. Collaboration is an engine that produces the visual end result. Quite often the actual process of creation can be seen in the resulting work. Participating artists: Jaya Pelupessy & Felix van Dam; Blommers & Schumm; Otto Kaan; Scheltens & Abbenes; WassinkLundgren; Taiyo Onorato & Nico Krebs; Anouk Kruithof & Jaap Scheeren. Follow a tour of SLN, given by museum lecturer Samantha Fles or join the Raphaël Dallaporta lecture with an SLN interpreter present. The tour begins at 15.00 and focuses on Collectivism, an exhibition about how artist collectives work together to give meaning and value to images. The lecture doesn't need to be reserved. The Department of Photography of the Gerrit Rietveld Academie has a tradition of regularly engaging in interdisciplinary projects. Every year students realise a number of collaborations, both within the academy and outside. The department seeks out partnerships with other academies and institutions, with the intention of learning from each other. Through the establishment of a dialogue and the development of an art project the necessity of collaborative projects for a contemporary artistic practice is emphasized. In this exhibition two recent and ongoing projects are highlighted: Residency: Photography & Psychiatry and Bookmaking: Photography & Graphic Design. Raphaël Dallaporta (b. France, 1980) is internationally acclaimed for his long-term collaborative projects with professionals from a wide range of fields. This exhibition presents two of his most recent collaborative projects: Correspondance (2015) and Chauvet-Pont-d’Arc (2016). These projects investigate the origin of images: the first original photo and the earliest preserved prehistoric cave paintings, respectively. In the past he has worked closely with a landmine clearer (Antipersonnel), a reporter who covers social work at its intersection with the law (Domestic Slavery), a forensic pathologist (Fragile) and archaeologists (Ruins). He is concerned with public issues addressing human rights as well as more symbolic subjects such as the fragility of life. He usually combines text and images. In 2011 Dallaporta was the winner of the Foam Paul Huf Award and to mark the occasion he presented four of his long-term projects in the exhibition Observation. In collaboration with the online art platform Patty Morgan, Foam presents the 'Patty Morgan Internet Café'. What role can the internet have in the perception of art, and is the internet a place where art is enriched or even deepened? Can art become more personalised and exclusive, or does the internet make it a common good? Within the context of an internet cafe filled with art, you can experience the interface between digital and physical, and explore what art and internet mean today. Foam Lab, Foam's department of young thinkers and creators, has designed an innovative project especially for Collaborate!. Print-à-Porter stimulates a playful interaction between the festival visitor at Foam and the potential festival visitor outside the museum. To make this interaction possible, two sites come into contact with each other: a photo studio and print shop located at Foam is connected live to a photo studio and print shop on location. In both studios, participants have their portrait photos taken. These photos are then forwarded to the other location and printed on the tote bags. This exchange process will be projected during the festival. 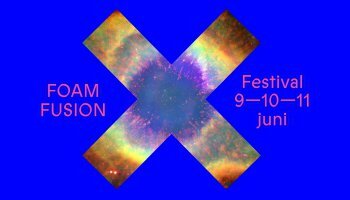 In Foam's first exhibition room, you are invited to check in for Foam Fusion. Two artworks register your presence; A third challenges you to act as an intelligent surveillance system does and question our behavior in public space. Art is working together with technology, science, and with you. The artwork of Jonas Lund exists by virtue of the viewer's gaze: his work VIP (Viewer Improved Painting) (2014) lets its compositions decide by tracking your eyes. Matthias Oostrik developed the interactive installation plplpl.pl (2016) in collaboration with technical expert Diederik Schoorl, sound artist Pandelis Diamantides and in partnership with BeamLab. Esther Hovers points out the dark side of the constant surveillance of our daily life with her work False Positives (2015-2016). She developed photomontages through collaborations with various surveillance experts. Does mankind decide how algorithms work, or are algorithms taking over in determining our standards? The Collaborate! programme is made possible with the support of Fonds21, the Mondriaan Fund, the Prins Bernhard Cultuurfonds and VSBfonds. Foam is supported by the BankGiro Loterij, De Brauw Blackstone Westbroek, Delta Lloyd, City of Amsterdam, Olympus and the VandenEnde Foundation.